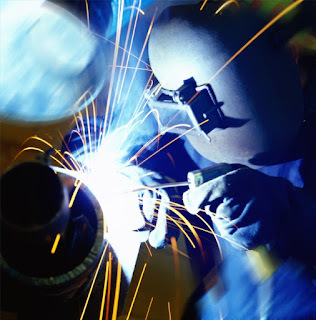 With DC Welders, CV or CC, What’s the difference? Electric arc welding has 2 main variables, Current and Voltage. 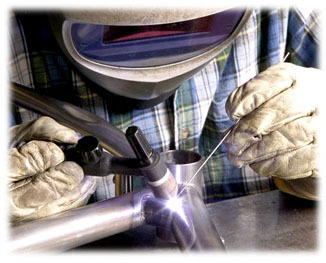 Welding machines will supply both, but are only capable of consistently maintaining one of those variables. The other is maintained by some other means. Direct Current (DC) power supplies can be Constant Voltage (CV) or Constant Current (CC). A Constant Voltage machine will provide a consistent, preset voltage. CV equipment is typically semi-automatic and wire fed. Presetting the weld voltage, a CV power supply will maintain a constant arc length (because arc length is directly related to weld voltage). So what determines the current draw? On CV equipment the wire feed rate, wire diameter and electrode stick-out are what draw current from the machine. Set at 28 Volts, your GMAW/FCAW equipment will set an arc length that that will remain constant. As you increase wire feed speed or increase wire diameter you will increase your welding current. By increasing current you will, in-turn, increase penetration. On the other hand, maintaining that wire feed speed and increasing electrical stick-out will introduce resistance into the electrode and reduce current, thereby reducing penetration. 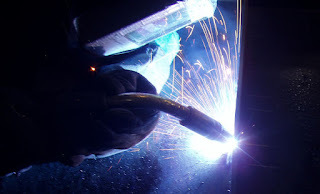 When a Welder fears burning through, he/she will increase stick-out, which will reduce current and penetration, reducing the chance of burning through. A Welder can easily reduce weld current 25-50 amps by simply increasing that stick-out. A Constant Current machine will provide a consistent, preset current. CC equipment is typically considered manual. Presetting the current, a CC power supply will maintain that amperage setting. So what determines the voltage? Remember what I said above about voltage being directly related to arc length? Voltage will be maintained manually by the SMAW or GTAW Welder. He/She will regulate voltage by moving that stick or tungsten electrode closer to, or further from, the work (and typically, less is best). That’s why I can’t Stick or Tig weld with a CV machine, and I can’t Mig weld with a CC machine.